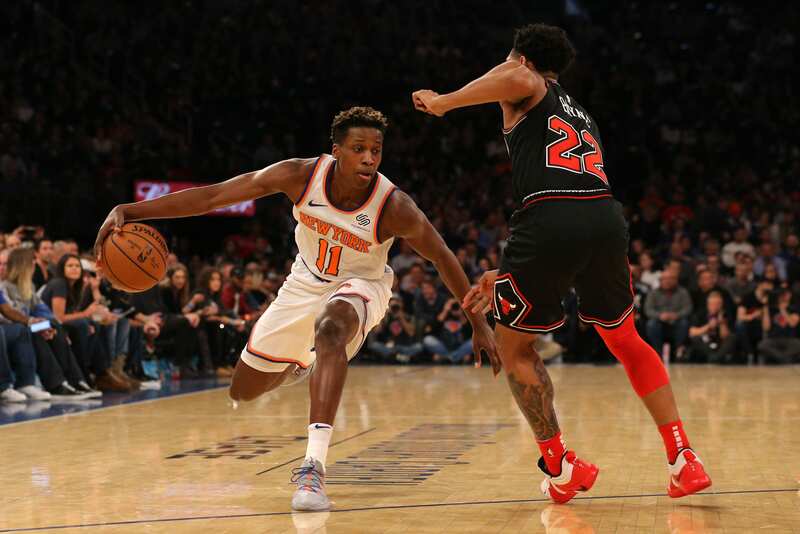 The New York Knicks lost back-to-back ugly ugly games against two of the worst teams in the Eastern Conference, at the Washington Wizards, 108-95, on Sunday then last night against the Chicago Bulls, 116-115. Quickly we’ll mention the first ugly game when the Knicks visited the Washington Wizards. The Wizards came into the game losing 5 straight with one of the NBA’s worst defenses. In the Wizards first eight games of the season, they have given up 124 points per game. Yikes. Whenever a stat like that comes out against the Knicks, it’s always a bad omen and it was. This was a game that the Knicks could easily win and they came out of the gates flat as ever. John Wall was able to do, basically, whatever he wanted. He was able to get to the rim with ease, as the Knicks interior D was nonexistent, per usual against teams with a below average big man. Wall ended up scoring 26 point in this contest. The Knicks just seemed flat and hungover in this game. It was not enjoyable to watch. Since the Giants had a bye and didn’t ruin our Sunday’s for once, I was thinking this could be an ‘OK’ Sunday and then the Knicks played. They did not want to be there and it showed by their lackadaisical demeanor on both sides of the ball. There was no fire on defense from the tip. The Wizards wanted to be there and forced 20 Knicks turnovers in the easy win. Also, frustration was finally seen on young Knick players like Robinson and Trier, as both received technicals for defensive plays against Dwight Howard and Wall. Now onto the second ugly game of the Knicks’ back-to-back against the Bulls at the Garden. The Bulls enter this game a hurt team, missing their best player Lauri Markkanen as well as Denzel Valentine, Kris Dunn and Bobby Portis. The Knicks were without Tim Hardaway Jr., lower back. But, Kevin Knox was available for the first time in 8 games. This game was, again, ugly until it started to pick up it the second half. The game was pretty much back and forth throughout with sloppy play by both sides. The Knicks had to fight their way back in the 3rd quarter to push the game into overtime and then another overtime. Kanter led the way for the Knicks with 23 points and 24 rebounds, but it was Emmanuel Mudiay’s coast-to-coast layup with 2.7 seconds remaining to second it into a second overtime. However, in crunch time, Mudiay had a lot of questionable defensive and decisions. Alonzo Trier still contributed with 21 points on 5-15 shooting despite being double-teamed for the entire game. The Knicks defensive rebounding and poor decision mamking is what lost them the game. The Bulls had multiple opportunities to put the game away in the 4th quarter and both overtime’s. The shots just weren’t falling until Zach LaVine took over with him career-high 41 points. LaVine hit some big 3’s down the stretch and ultimately the game-winning free throw with 0.2 seconds remaining. Not having Hardaway Jr. really hurt the Knicks, as it showed. There was a lack of scoring and big time shots when the Knicks needed it the most. Also, the overall team decision making was questionable throughout. Mario Hezonja taking to many untimely shots, Dotson rushing shots, lazy team fouls, it was a lackadaisical performance all around. Hopefully Hardaway can return for their game on Wednesday as the Knicks take on another rebuilding team in the Atlanta Hawks at 7:30 pm.